Is Britain in for a fiery hot treat this summer! Britain is usually known for its set weather periods in all seasons however, when the summer period sets in people generally feel the need to relax and take time out and there are normally only a handful of sunny days to enjoy never the less, they aren’t known to be tremendously hot. During the past few days the current weather forecast has proven to be a great turn for Britain’s weather trend as the hot sunny spells are due to last more than 10 days! It doesn’t sound so long but for anyone who has been a long term resident in Britain and knows what the weather can be like, this sure is a treat! With temperatures rising day by day, thermometers are anticipated to hurtle up into the baking hot 80F during this week and heat like this is also expected to aggravate further weather conditions and may even cause Britain to experience thunderstorms and torrential rain at some stage. The hottest temperature to be taken in UK so far has been recorded at 32.30DC (90.1F) last week in Gravesend, Kent. The Met Office have stated that the weather will more than likely keep rising this week with continuous blue skies and endless days of sunshine for many locations. 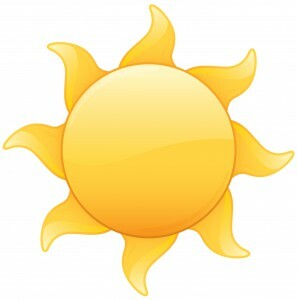 “There is lots of sunshine and just patchy cloud on the way this week, with temperatures creeping up quite high again. In the south east we could see 29DC [84F] while the rest of the country will be in the mid 20s [79F].” She also mentioned that the temperatures at night will also stay quite high but there are bound to be an increased risk of thunderstorm. “The heat is really going to hold on which means the summer holidays are off to a brilliant start and it looks like this for the rest of July. There is a further risk though of thunder storms but they are not going to stave off the heat, it is more likely to keep building what we expect is a continuation of this very sultry, muggy tropical feel with some more very high temperatures on the way”. Although some areas around Britain are enjoying the pleasant weather, some places where unfortunate and had to deal with a torrential downpour over the weekend where the amount of rain was measured at more than three inches and had fallen in a matter of hours. The country of Essex where exposed to flash flooding resulting in everyday activities grinding to a halt and even leaving some homes with no power as well as train services being interrupted. What do you think of Britain’s latest weather craze?